Here’s what we CAN do, … and what we can’t. Click on the tabs below to find out what we can do at Leonard’s. *Rebind hardcover books in leather, cloth, special paper, or combinations, such as half leather or three-quarter leather. *Rebind as a hardcover or as a softcover, even if the cover is completely missing. *Embed (inlay) part of the original cover into the new cover. *Create raised ribs on a spine. *Imprint using gold, silver, or colored foils, and create leather labels for spine titling. *Create blind-stamped or hand-tooled embellishments in leather. *Replace a spine (re-back) with leather or cloth and replace worn leather corners. *Repair sewing, even if the binding is totally split, using cord insertion (a variation of kerf saw binding). *Touch up the color on faded leather.and sometimes cloth. *Replace end pages with standard leatherette, cotton rag or other acid-free paper. *Repair torn pages using acid-free document tape or mending paper. 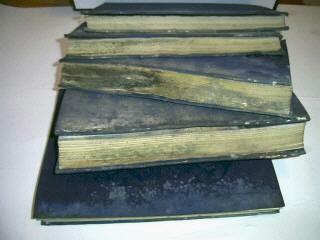 *Repair hinges on leather or cloth books. *Rebind a Bible in a flexible soft leather cover, even if the original cover is completely missing. *Rebind a Bible as a hardcover in cloth or leather. *Create blind-stamped or hand-tooled embellishments in leather, and Imprint using gold, silver, or colored foils. *Rebind a Bible in one of our specialty styles. *Tighten sewing, or repair sewing, even if the binding is totally split, using cord insertion (a variation of kerf saw binding). *Install new ribbons and headbands. *Repair pages using acid-free document tape and reduce wrinkling. *Put a cover back on a Bible. *Repair and restore large family Bibles, preserving important family notes and making the book presentable and functional. *Restore antique books to a condition as close to the original as possible, or totally rebind them to gift copy condition. To read about why we use real leather, click on the leather picture below. Click here to read why we use real leathers. *We can’t reverse the browning process on low-grade paper. De-acidification is costly and sometimes hazardous, but even that will only stop the process, not reverse it. *We can’t repair sewing on a book that never had sewing in the first place (but we can insert binding cords). *We can’t repair dry-rotted leather without the repairs being noticeable. *We can’t repair water-damaged or mildewed paper. You might want to try your local fire restoration company for that. *We don’t bind theses or do total binding. We’re not publishers. We’re basically set up for repairs, rebinding, and restoration. *We don’t rebind large runs of books . . . but we’ll be happy to refer you to someone who can. *We don’t do page edge gilding and logos. We’re always expanding our options, but aren’t set up for this at present. *We don’t do zippers. These are best done when a Bible is new. Zippers done poorly are destructive. *We cannot duplicate by hand what was done by computers and high tech machines that made thousands of copies at the same time. *We do not do creative work on books that would compromise our convictions. See our links page for referrals to reputable companies who do some of the above. All our bookbinding is done by hand with T.L.C.–no machines, no elves. We believe you will be pleased with the results. Click here to see what others are saying about our work. Or see our FAQ page. Click here for a free custom quote. Still have questions? Give us a call or send an e-mail.